If you have been to Edith Wharton’s The Mount in Lenox, the beauty and history of what was once this famous writer’s home is always worth another visit. I have had wonderful opportunities of listening to the Authors’ Lecture Series, participating in Wharton Readings on the Terrace, watching Wharton Salon plays, and journeying through the flower garden. A special reason for a return to this stately house and its grounds is SculptureNow. While the creative and elaborative project is in its sixteenth year, for the first time, it “now” expands the 40 acres of The Mount’s estate. 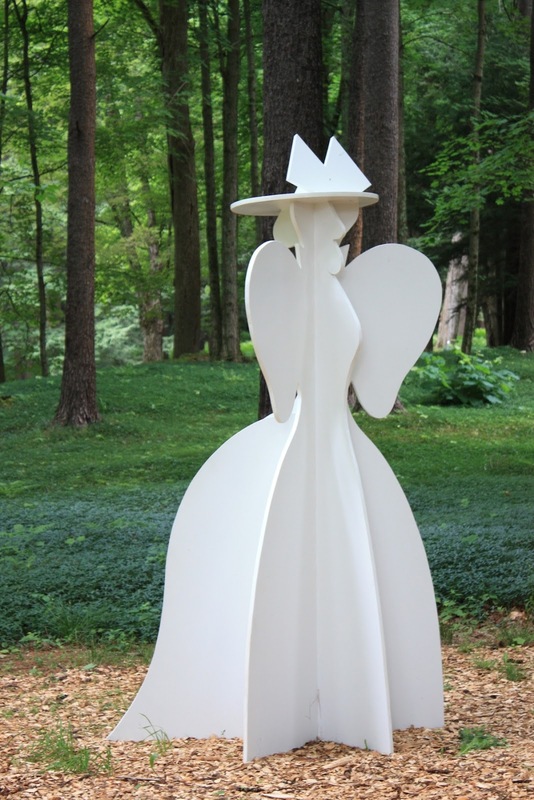 These pieces of contemporary outdoor art are huge and heavy – up to 60,000 pounds. In the meantime – through October 31 – this art is for all to experience on the wide open, seemingly manicured lawn of The Mount. Twenty-four professional sculptors, many of national renown, were selected for this juried show. The material used to create their works include stone, steel, clothe, soil, glass, granite, rope, wood, and/or industrial waste products. Last week, Ann Jon, SculptureNow’s Executive Director and a sculptor whose art is also in the show, gave my friends and me a sculpture-by-sculptor tour. She explained that not only are the types of art, subject matter, materials, and shape considered when executing a sculpture show, also and literally, the lay of the land. Some designs fit nooks and crannies on the acreage; others naturally fall into valleys or on hills, while others lay perfectly on slopes. Certain colors and textures show off in woodsy areas, while bronze structures seem to naturally lie on the pristine green grass. Setting the theme, called Confluence, is Jon’s job. Names like George Rickey, Jonathan Prince, Richard Erdman, and Tim Prentice are the who’s who in the world of sculpture, each with art in the exhibit. The talents of 20 other crafters, one-third from Berkshire County, along with art students from Pittsfield High School (who created one exquisite triangular piece of drawings on metal, which was also the very first art sold), make the show complete. We walked nearly the entire grounds of The Mount, finding sculpture easy for the viewing and others a bit hidden. My favorites were “Edith Wharton Takes a Walk,” made of metal, painted white, in the shape of a women in full dress of the early 1900’s whose shape was identical from all angles; and “The Writing Hut,” seemly simple, made of brown wood nailed together to look like a large box, inside a steel desk inviting writers (perhaps me) to enter. I did. Another work of art was titled “Erratic.” Not my favorite, although on the list of one of my friends’ best choices, this big stone and, undoubtedly, heavy cavernous creation with a slight opening permitted her to enter, albeit sideways and dipping her head until in the center. Not for the claustrophobic. Some sculptures are easily identifiable such as a giant steel paperclip. Others are a bit more mysterious. And most leave interpretation to the viewer. Many are stable, yet some have movable parts when pushed or prodded by the wind. Jon calls the exhibit at The Mount, “an amazing green gallery.” Yet, there were other factors to weigh besides beauty when choosing the sculpture and designing the configuration at The Mount. The judges asked questions as they made the selections: was the piece creative, how well was it built, will it withstand four months in all kinds of weather, and was it safe? The last factor was particularly important because sculpture might have sharp points or jutting edges, for example. The exhibit is free with admission to The Mount. Guided tours are offered on August 18, September 22, and October 20. SculptureNow is a non-profit agency, working in collaboration with The Mount, with the assistance of the Berkshire Taconic Community Foundation and the Massachusetts Cultural Council. For information contact annjon@bcn.net or www.sculpturenow.org.